Despite the chill in the air, the sun is shining this week! In between getting ready for our annual Friendsgiving, my mom has been helping me put up our Christmas Tree and a few other decorations. It seems crazy to be starting this early but it just made sense given our schedule over the next few weeks. I’m already enjoying the soft glow of the tree lights at night. These beauties have also put a smile on my face for the past few weeks. J helped me assemble these plants to flank either side of our porch earlier in September and they are still going strong. Isn’t it amazing how a pop of yellow can instantly brighten your day? One more item checked off the Fall Bucket List! I absolutely love Fall and especially the month of October. Despite the chill in the air, it is usually still warm enough to enjoy outdoor activities. Inspired by the to-do lists I’ve seen pop up on Pinterest, as well as this awesome post HERE, I’ve crafted my own bucket list for this “wonderFALL” season! Dress up the front porch with cheerful, bright mums! DONE! Decorate the house for Halloween. DONE! Visit the pumpkin patch with James. Savor the changing leaves. DONE! Make pumpkin bread and cookies. DONE! Make homemade chili with my Mom. DONE! Enjoy sitting on the patio while it is still warm. Design or find a fun maternity Halloween costume. DONE! Bake a pie with my Grandma. Continue our Friends Thanksgiving tradition. DONE! Be grateful, everyday. WORK IN PROGRESS! It’s already starting to look like Halloween around here! Last year, a good chunk of our house was under renovation so I opted not to pull out any decorations. Photo taken by Kate Hayes at our Halloween party in 2010! We have lots of reasons to celebrate this month: our 3rd wedding anniversary, J’s 30th birthday, and an upcoming whirlwind trip to the beach! 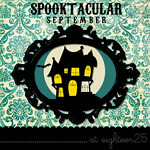 Have you heard of Eighteen 25’s Spooktacular September? These lovely ladies are featuring fun Halloween craft ideas from other bloggers every day this month. I am honored that they shared my idea for Halloween Treat Bags today! Head over to Eighteen25 to see what I made with this fun spider embellishment and craft paper!